As part of Syracuse University’s Courage Day celebrations honoring military and veteran organizations on Saturday, Nov. 6, four graduates of the Whitman School of Management’s Entrepreneurship Bootcamp for Veterans with Disabilities (EBV) program have been selected to serve as honorary captains of the Syracuse University football team for the game against the University of Louisville. The four veterans—Jesse Canella (Ridgewood, N.J.), Dalia Rivera (Aberdeen, Md. ), Henry Rivera (Aberdeen, Md.) and Terry Sims (Dayton, Ohio) —are all 2010 graduates of the EBV program. 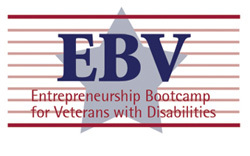 The EBV was first launched at the Whitman School of Management in 2007, and is a world-class training program in entrepreneurship and small business management offered to post-9/11 veterans with disabilities resulting from their service. The program has since expanded to a network of other business schools across the United States that includes UCLA’s Anderson School of Management, Florida State University’s College of Business, the Mays School of Business at Texas A&M University, the Krannert School at Purdue University, and the College of Business at the University of Connecticut. Canella deployed to Al An Bar province of Iraq as an infantry rifleman, and while deployed he conducted more than 180 missions. Canella came to the EBV program to learn the skills he needs to launch a not-for-profit venture called HonorVet, an online forum where veterans can share their transition-related struggles and experiences with other veterans and professional counselors. In addition to representing the team on the field at the start of the game on Saturday, Canella will also speak to the players and coaches during their final practice before the game on Friday. The EBV graduates will also take part in a very special presentation during halftime of the game. On behalf of the Dream Machine recycling program, Jeremy Cage, senior vice president of Innovation and Insights at PepsiCo Beverages Americas, will present the EBV with a $500,000 donation. The Dream Machine program—a multi-year collaboration between PepsiCo (NYSE: PEP), Waste Management (NYSE: WM) and Keep America Beautiful—was designed to drive success around PepsiCo’s goal of increasing the U.S. beverage container recycling rate from 34 to 50 percent by 2018. The program is introducing thousands of recycling bins and computerized kiosks at popular locations across the United States to offer people a convenient and rewarding way to recycle their bottles and cans while on the go. The more that people recycle in a Dream Machine, the more support PepsiCo can provide EBV. To learn more visit: www.facebook.com/DreamMachine. “Recognizing these four outstanding veterans as a part of Courage Day is a small gesture on our part, when compared to everything they have sacrificed for this nation. It will truly be a special day here at Syracuse University,” says Melvin T. Stith, dean of the Whitman School.